…on your own & No technical skill required. 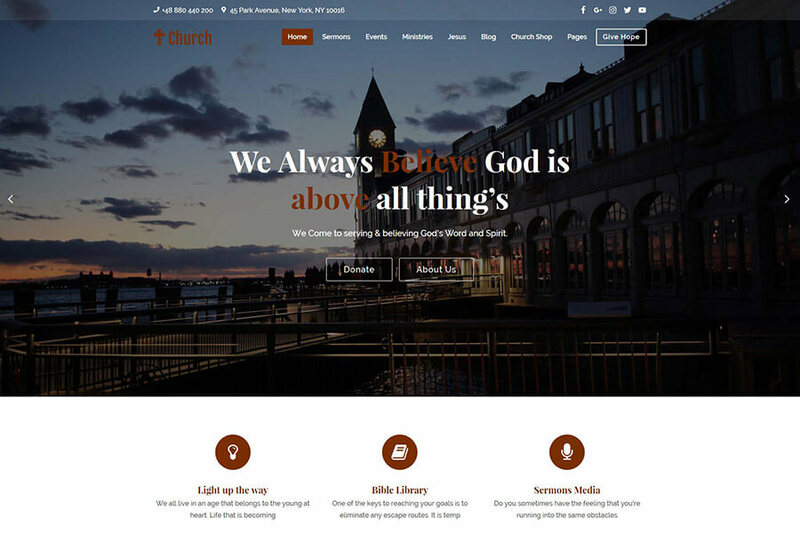 The Church WordPress theme can be used to create any kind of church related websites or for spiritual, cathedral, chapel, Shrine, monastery, convents, or any other place of worship. 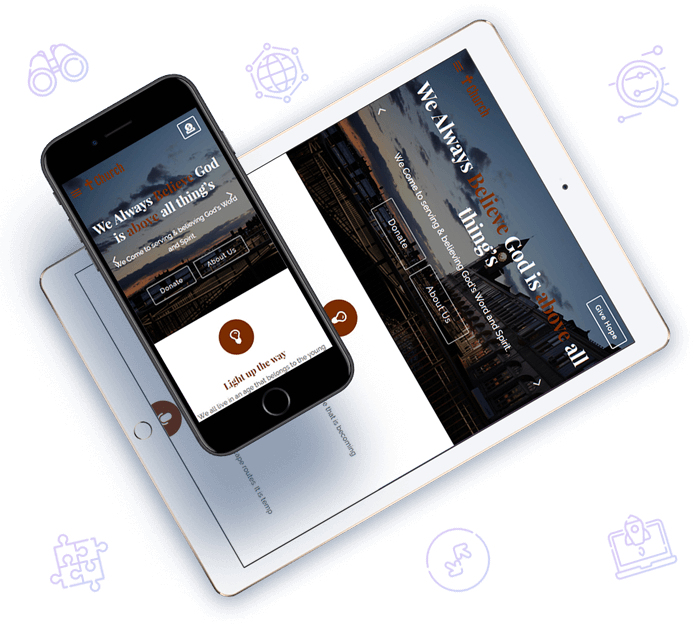 It is more like a ready to go Church website, with beautiful design and features, and simple options to manage your entire site. 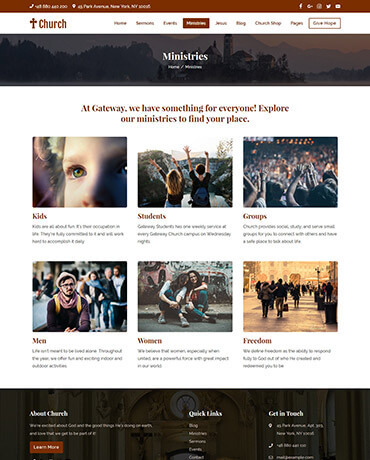 All you need to do is to install this theme and update the content to turn it into your own, unique Church website. 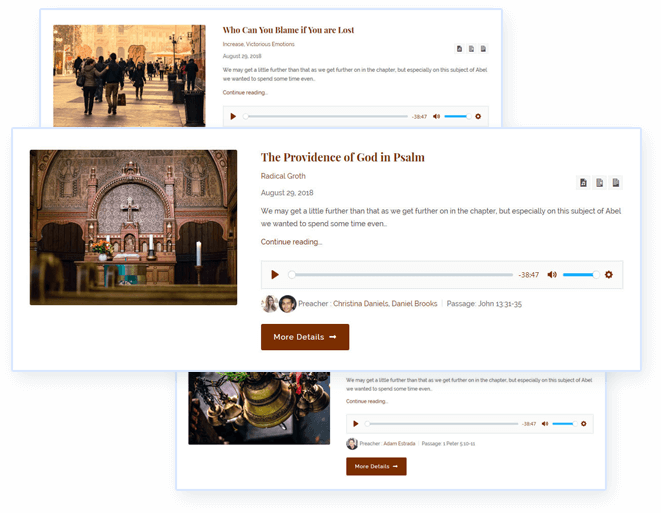 The inbuilt post type for sermons allows you to post sermons in text, PDF, Downloadable files, audios and videos. So you can put your Church’s sermons online for those who missed it. 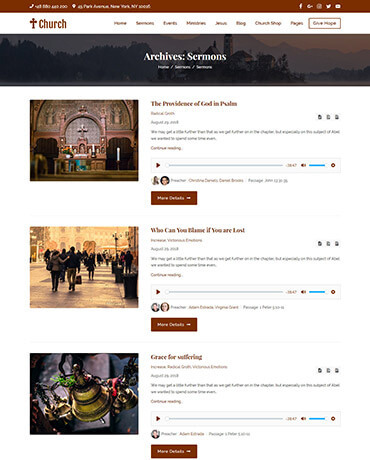 You can even maintain the sermons archive on your Church website. Many reasons to give this theme a five-star rating… Great customer support is top on the list. They respond to my questions quickly. 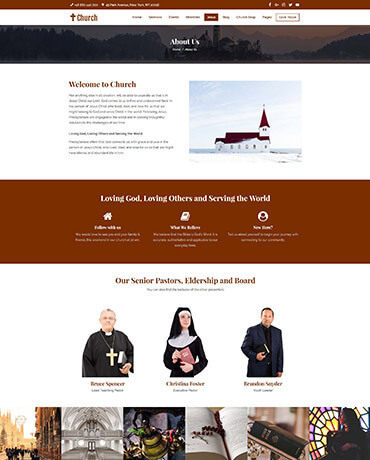 The template design is great too with lots of features for my church website. Highlight your church, religious & non profit events on your church website. 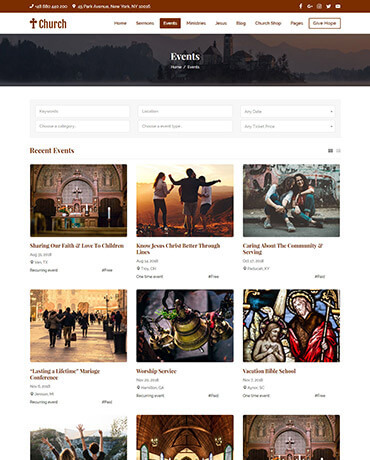 Your Church website is a medium to announce the events through the special event post type. 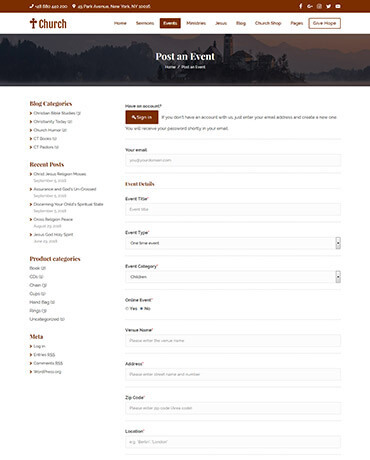 It includes well organized event detail pages and easy post an event features. So along with the church website, you can start a whole non-profit event portal through your church website. 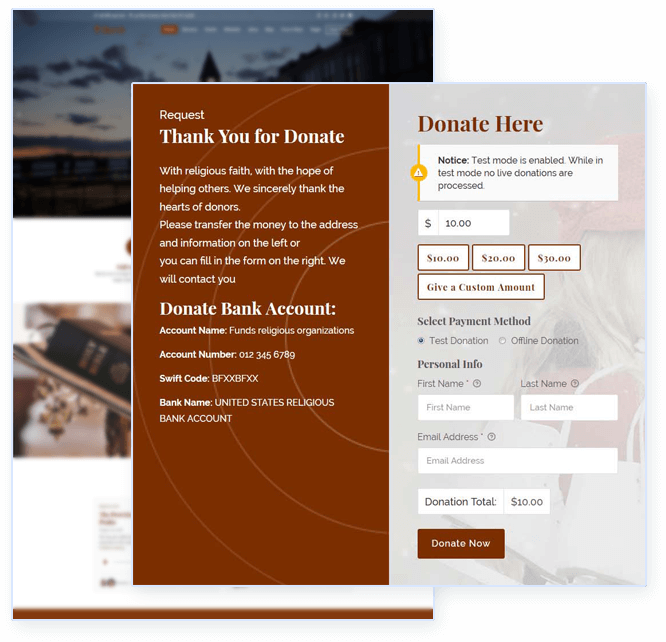 There is an inbuilt donation system that allows you to easily accept donations through your Church website. Besides, you get a pre-designed donations page to start accepting donations right away. 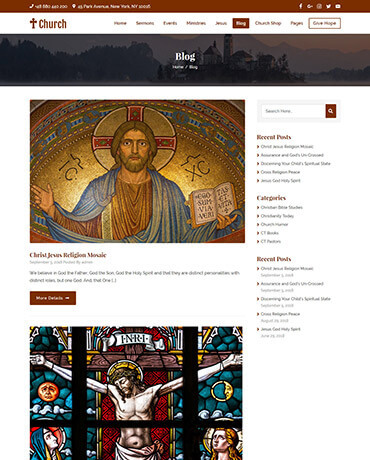 This WordPress Church theme is perfect for Churches, religious websites, or sites to represent religious communities. It can be used for your project for a local church, or for a congregation, or a Pastor’s personal blog aside the church’s own. 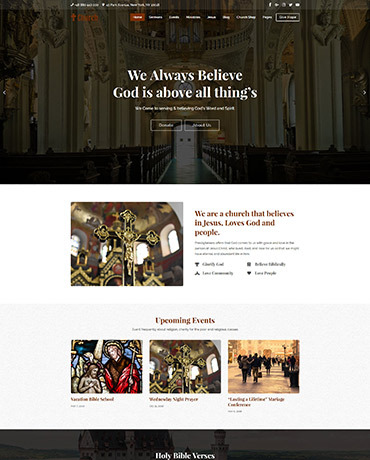 Using this theme you can create beautiful Church websites with minimal time, money and efforts. It can be used for different purposes for creating websites for religious & spiritual places like cathedral, chapel, Shrine, monastery, convents, or any other place of worship. 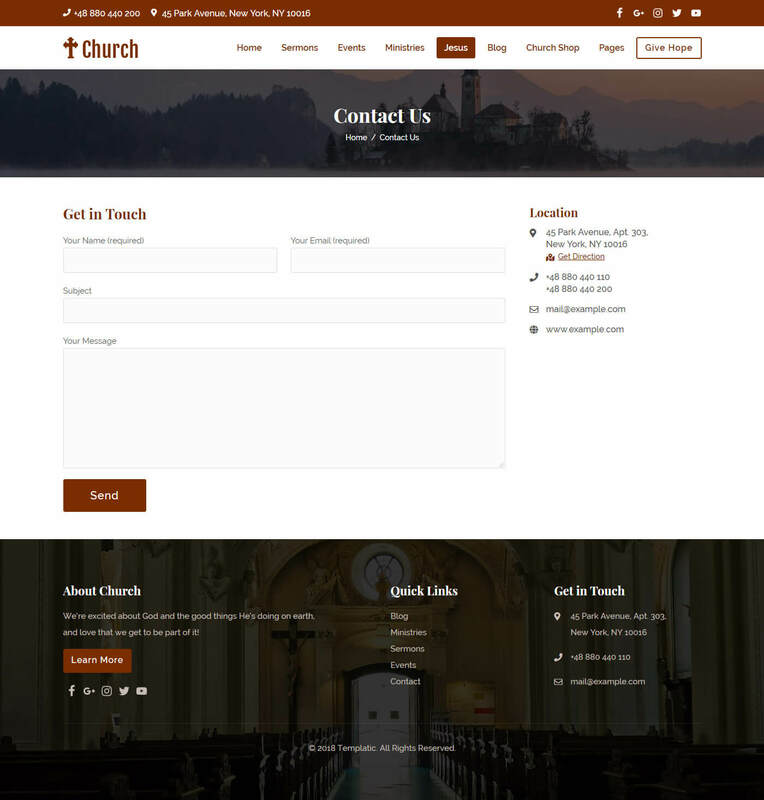 Your church website built with the Church WordPress theme will look great on any device it is viewed on. 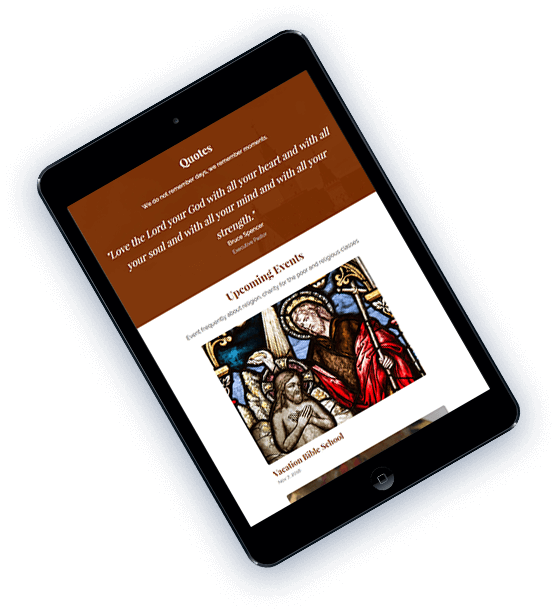 The Church theme is elegantly responsive and renders well on mobile devices of different sizes and resolutions. Seeing is believing! 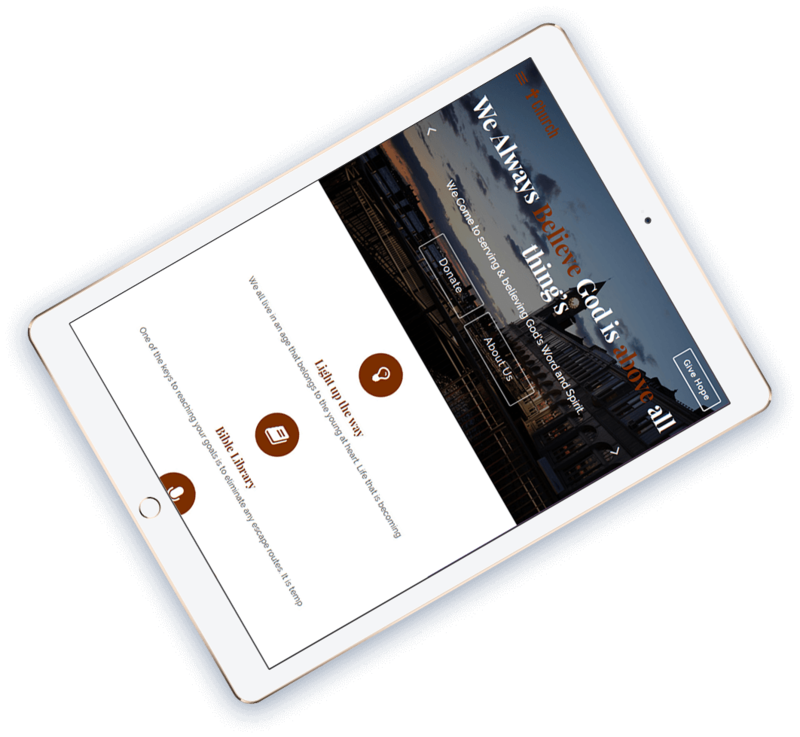 Check the theme demo on your mobile phone to see how your site will look. Church WordPress theme features a full screen banner and beautifully designed sections to reflect the purpose of your site! And if you want to change something about it, you can easily edit or create your own page designs with the drag & drop page builder. 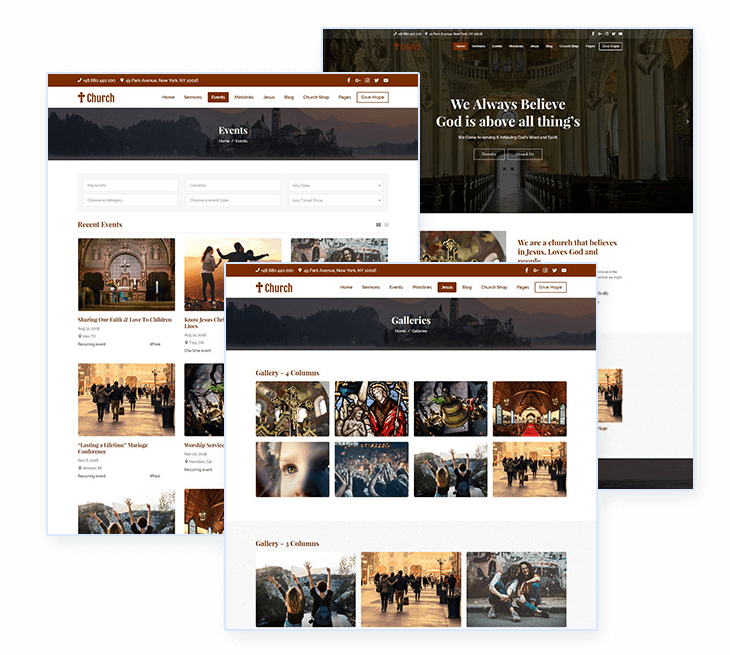 Wish to sell through your Church WordPress theme? I have used the Templatic Theme Church. The themes is professionally coded and fully editable with elementor support. I found the support excellent, the Templatic support team were always helpful .I can honestly recommend Templatic Themes and services. 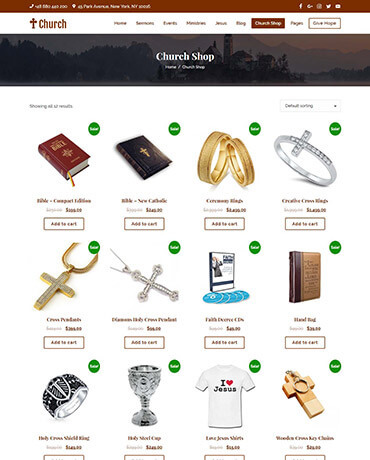 At a very affordable price, the Church theme offers you a complete package of all the features and qualities that you would like to have in your religious website. So no need to spend days, if not weeks, to create your church website, you can get it live in just minutes. 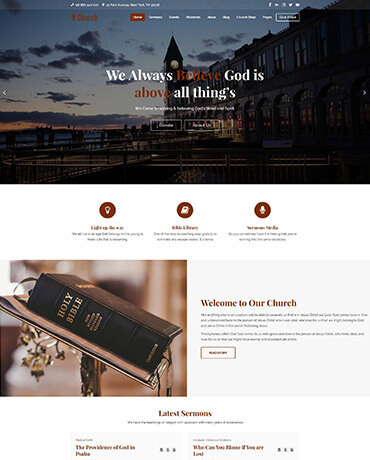 TThe Church website template for WordPress is designed with love after thoroughly studying the best Church websites and analyzing their features. 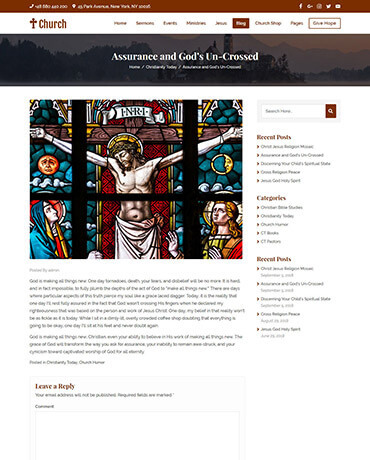 The pre-designed pages of this church theme are carefully crafted to let you tell your story. On the other hand, the pages are totally customizable and you can customize them with the included drag and drop page builder. And wait, you can easily edit the pages of your site using the drag and drop page building tools. 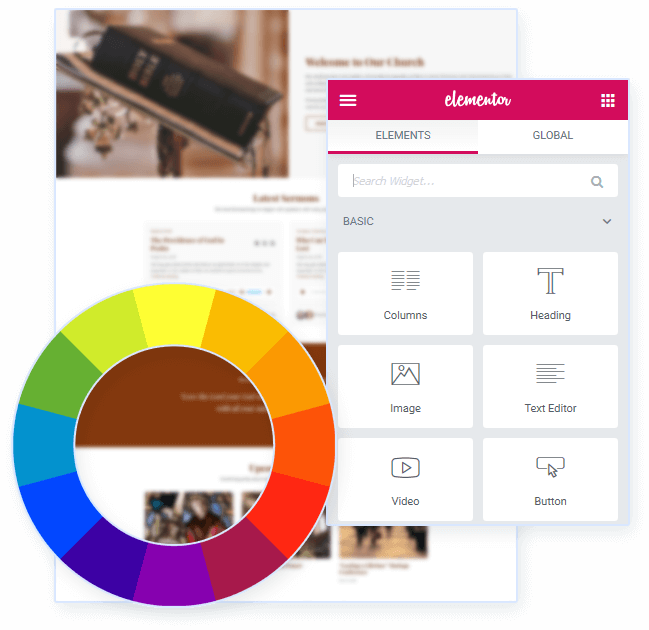 The Church WordPress theme is fully compatible with the Elementor Page builder. 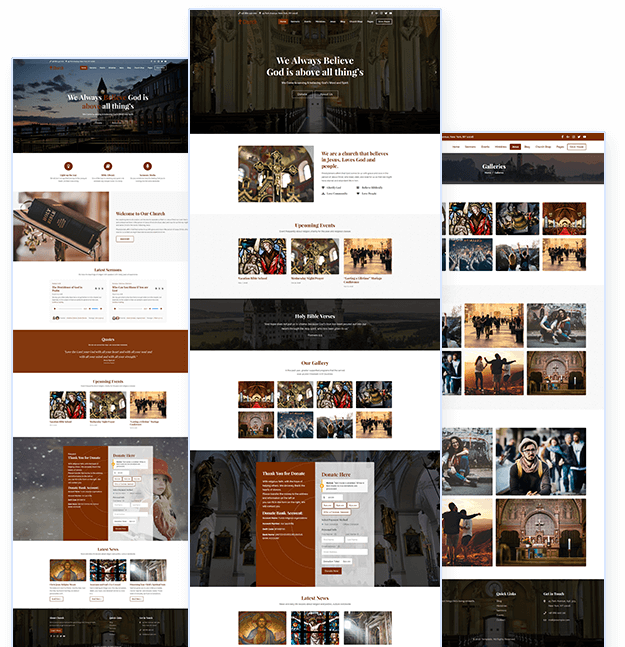 The Church WordPress theme is crafted with the best SEO coding practices. Furthermore, you can use the best SEO WordPress plugins. So, you’ve got a strong SEO based framework for your site, while on the other hand, you can use the plugins and ensure that the content you are adding is SEO optimized too! 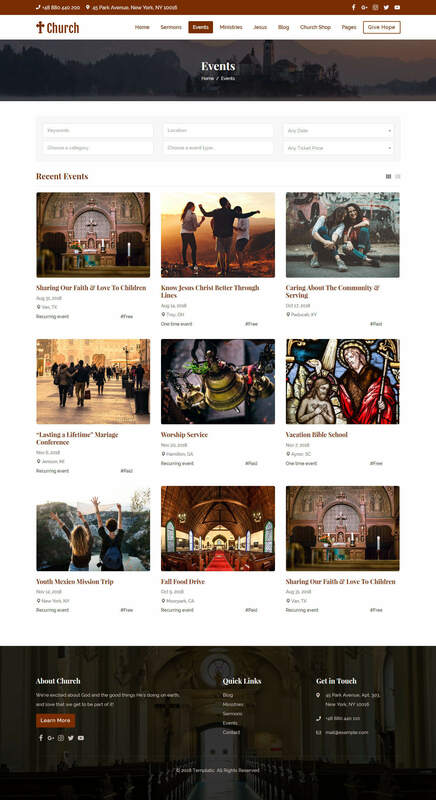 With the Church WordPress Theme, you get the best of both the worlds. Display advertisement banners wherever you want on your site. This way you can earn some passive income, or advertise your causes, events, products. 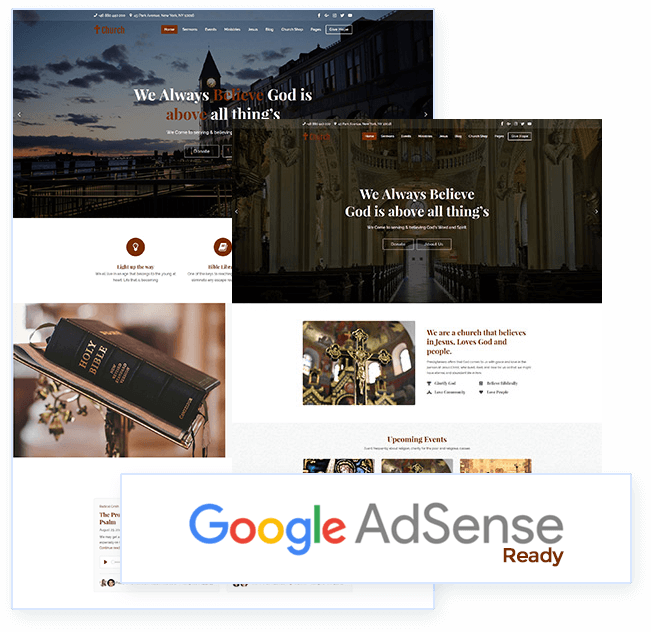 Besides, you can use services like Google AdSense or show static advertisement banners on your Church website to earn through it. A redefined installation experience with an organized setup wizard. 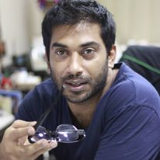 All you need to do is follow this wizard that will install all the required components, step by step. 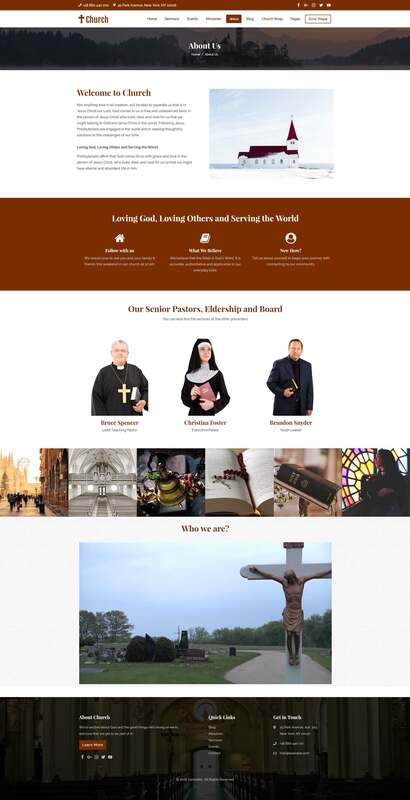 Sample data makes your website look exactly like the Church Theme demo. 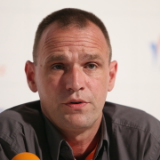 It gives you a headstart with the example listings, widgets in position, and sample content. You have the full control over how your site looks. With the elementor page builder, you can completely transform the existing sections or design new ones. 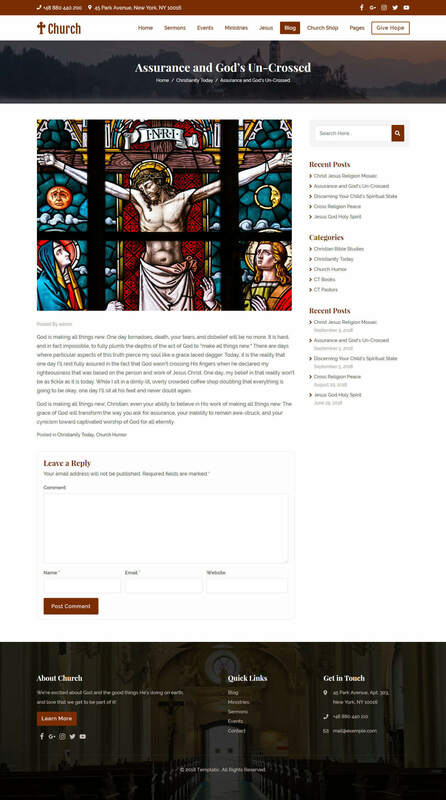 The inbuilt page template designs are great to quickly publish content of your Church site. Or you can create and save your own templates using Elementor. 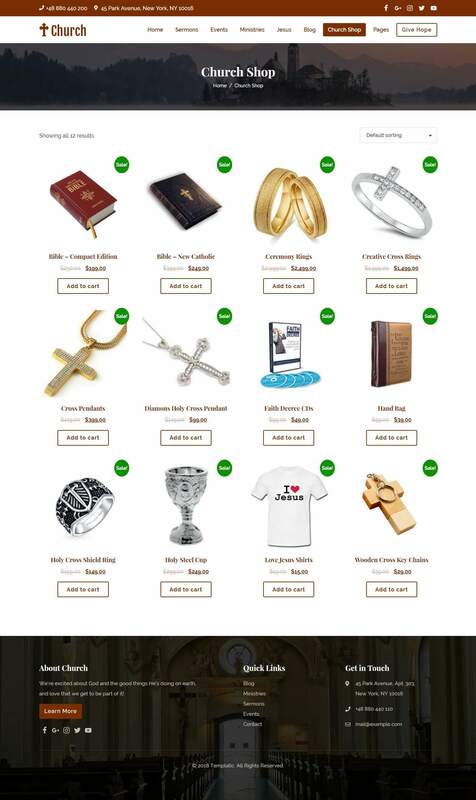 Your church website must never disappoint. 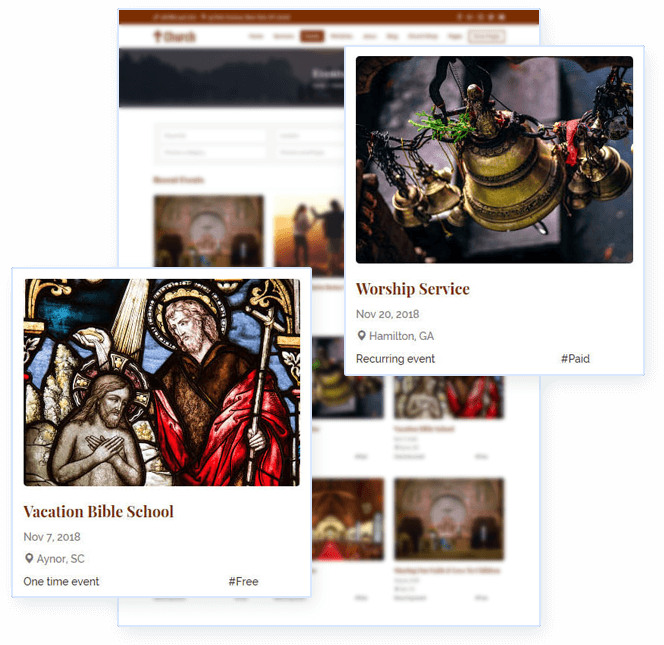 Therefore, the WordPress Church theme is cross-browser compatible. 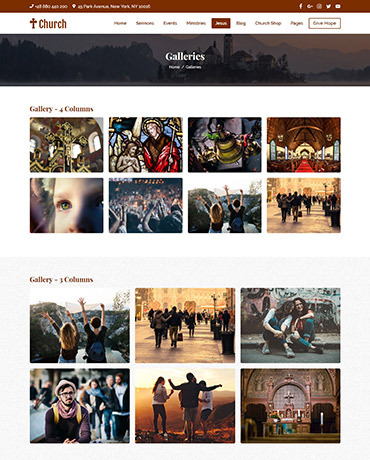 Create engaging galleries with the inbuilt feature to convey your story through pictures. 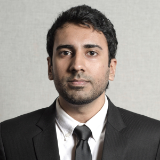 Elementor plugin lets you manage the gallery properties easily. You have some ready to use shop pages. 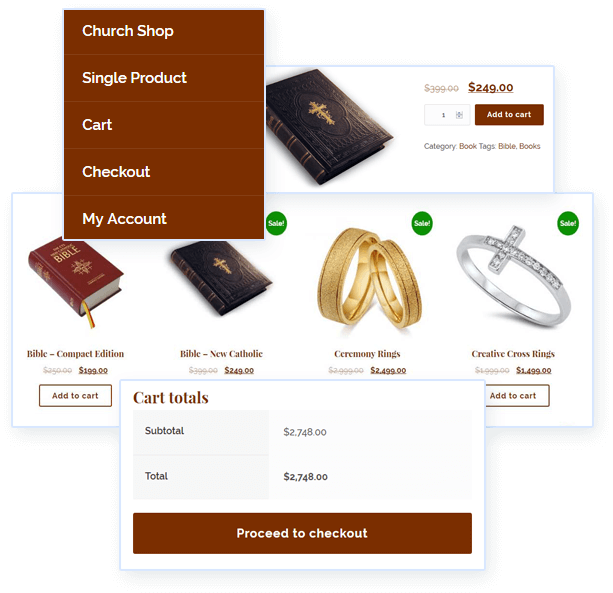 So creating a shop along your church website only takes minutes. Deliver your message of love, hope and faith to the masses with the help of blogs. 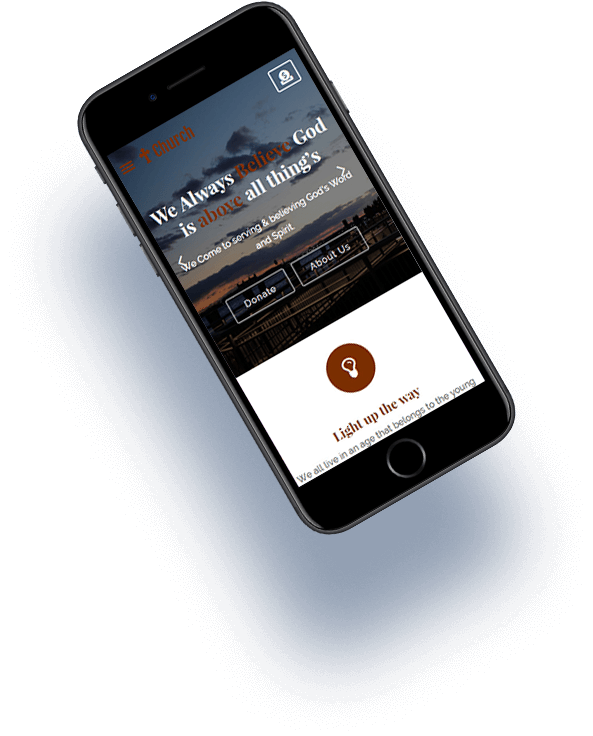 You can write anything- about your church, beliefs, share inspirational stories or just update your visitors with the latest news about your church. 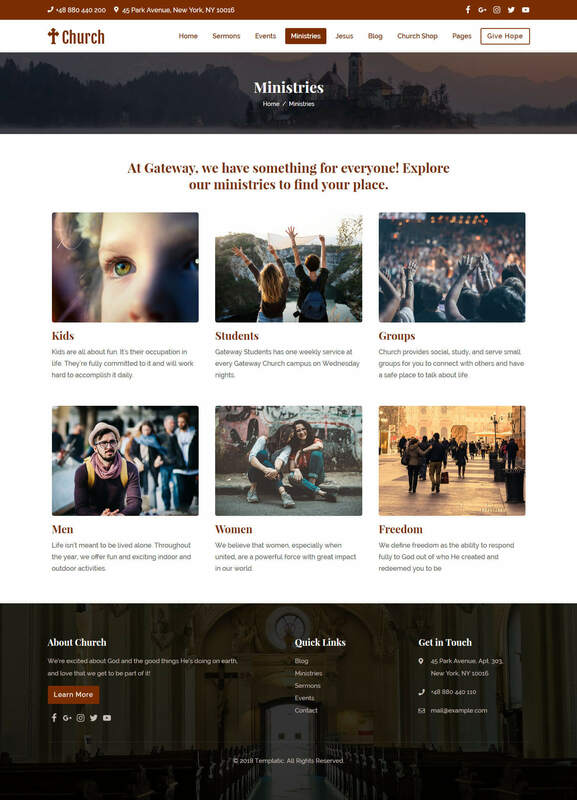 How long can I use this Church Theme for WordPress? 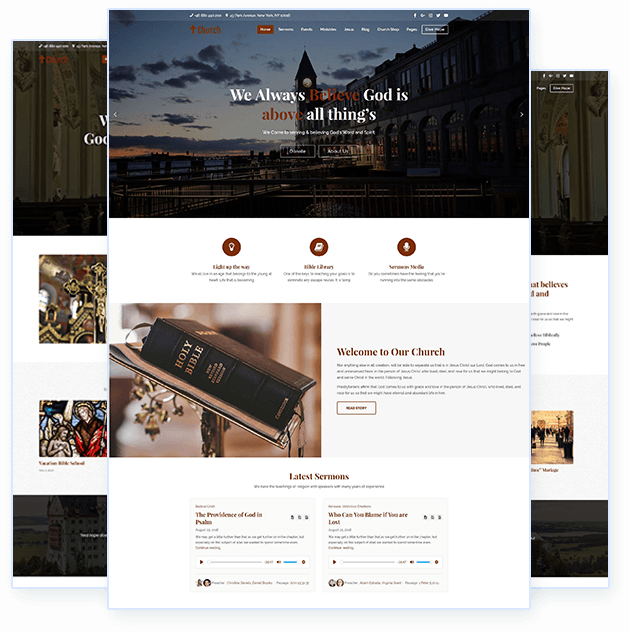 Once purchased, the Church WordPress theme can be used forever. Even though the technical support and updates are limited to one year, you can still keep using the theme without updates. How can I update the Church theme when a new version is released? Whenever a new update is released, you will be notified. You can update this WordPress Church template, by a single click, through your dashboard. I wanted to try the Church WordPress theme before buying? 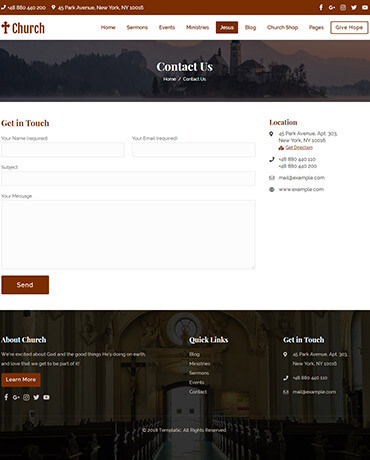 If you want to try the Church theme before buying it, please contact our support. You can even contact us for any other pre-sales queries. How many domains can I use this Church WordPress theme on? The number of domain this Church WordPress theme works on is determined by the type of license you purchase. The basic license allows you to use this Church theme on one domain, you can choose a different plan if you want to use it on more than one domain.